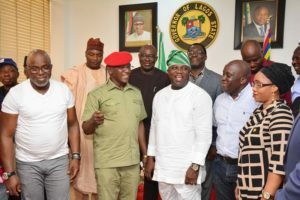 Lagos State Governor, Mr. Akinwunmi Ambode (middle), with Minister of Youth and Sports, Mr. Solomon Dalung (2nd left); President, Nigeria Football Federation (NFF), Mr. Amaju Pinnick (left); Special Adviser to the Governor on Sports, Mr. Deji Tinubu (2nd right) and Commissioner for Youth & Social Development, Pharm. 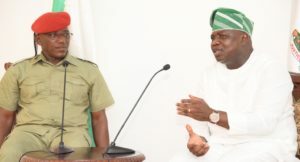 (Mrs) Uzamat Akinbile-Yusuf (right) during the minister’s courtesy visit to the Governor at the Lagos House, Ikeja, on Wednesday, March 1, 2017. 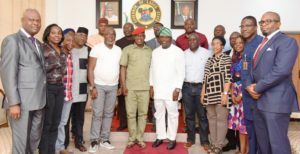 Lagos State Governor, Mr. Akinwunmi Ambode (6th right), in a group photograph with Minister of Youth and Sports, Mr. Solomon Dalung (6th left); President, Nigeria Football Federation (NFF), Mr. Amaju Pinnick (5th left); Special Adviser to the Governor on Sports, Mr. Deji Tinubu (5th right), Commissioner for Youth & Social Development, Pharm. 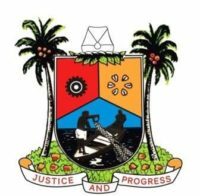 (Mrs) Uzamat Akinbile-Yusuf (4th right) and others during the minister’s courtesy visit to the Governor at the Lagos House, Ikeja, on Wednesday, March 1, 2017. 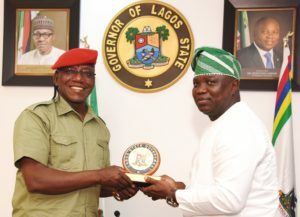 Lagos State Governor, Mr. Akinwunmi Ambode (right), with Minister of Youth and Sports, Mr. Solomon Dalung during the minister’s courtesy visit to the Governor at the Lagos House, Ikeja, on Wednesday, March 1, 2017. FUN SEEKERS AT THE NEWLY COMMISSIONED JOHNSON JAKANDE TINUBU (JJT) PARK, ALAUSA, ON TUESDAY, DECEMBER 19, 2017.